Host Keith Olbermann introduced the segment with a clip of Clinton arguing that members of Congress should declare themselves as either "with us or against us when it comes to taking on the oil companies." The MSNBC host seemed rankled at her use of the "with us or against us" phrase as he relayed Barack Obama's charge that her plan was ripped off from Republicans. Olbermann: "Senator Obama not alone in believing that that phrase, "with us or against us," had been borrowed from President Bush, as he claimed today. The Illinois Democrat again pointing out that Senator Clinton's gas tax plan already seems to have some friends on Capitol Hill." Obama referred to John McCain's support for the gas tax cut in a soundbite. Notably, Olbermann did not take note of the fact that Senator Clinton had already used the term "with us or against us" referring to the war on terrorism after the 9/11 attacks, even before President Bush used the term as he sought the united the world against Osama bin Laden and the Taliban. After introducing Alter, Olbermann suggested Clinton was pandering as he asked if the Clinton team were "hoping that underestimating the intelligence of the electorate will work every time?" Alter made his suggestion that voters would have to be "stupid" to support a gas tax cut: "They're essentially assuming that people are too stupid to realize that this is a bad idea that won't save them any money at the pump, that actually hurts us in fighting terrorism because we need to stop relying on oil from the Middle East. You know, it was oil money that funded those madrasas, that indoctrination of jihadists." He even predicted dire consequences both to the economy and for the safety of motorists if the tax cut goes through: "By the estimates of the Department of Transportation, this will cost 300,000 jobs, just this summer in the construction trade, not to mention making it harder for you to get to work, more likely to get into a car accident because it will bring repairs of our highways to a screeching halt." Alter soon found a part of Clinton's plan he liked as he voiced support of her proposal for a windfall profits tax on oil companies, but took her to task for supposedly claiming that the revenues would be used to replace gas tax revenues even after having already promised the same revenues would be used for alternative energy research. Alter: "Just one other thing that is particularly strange about this. She talks about a windfall profits tax on the oil companies, which is a good idea -- Obama and others support this as well. The problem is: that won't pay for this gas tax holiday because she's already said that the money from a windfall profits tax will be used to develop renewable energy. So she's spending that $9 billion twice." Alter suggested that "elites" would see through Clinton's tax cut plan as he argued that while Clinton is "hoping that only elites will notice any of this and that everybody else just won't care," her problem was that "there are a lot of elites who are superdelegates, and they're not buying this." In Olbermann's final question to Alter, the Countdown host queried whether Clinton's tax cut strategy might work as he argued that "a man dying of thirst rarely questions whether the water is clean or where it has come from," and asked, "Does she not have a winner here with this gas tax idea?" Alter then, after having earlier suggested that one has to be "stupid" to support the gas tax cut plan, argued that there may be enough voters willing to support the plan, as he labeled such voters as "low information voters." Alter: "She might because there are a lot of what are called "low information" voters. You know, they're really not reading the unanimous, unanimous newspaper editorials against this. They're not talking to the environmentalists, the economists, everybody who unanimously believes this is a bad idea. They're, you know, understandably struggling, and at the pump, they're paying a lot for gas, and they want some relief." After suggesting a tax credit for lower income people instead of a gas tax cut, Alter again slammed Clinton's proposal: "This is the single worst kind of relief because it's terrible for global warming, terrible for foreign policy, and terrible for jobs. And so it's just unfortunate that she had to embrace what people agree is the worst single policy idea of the entire campaign." KEITH OLBERMANN: Senator Clinton keeping her symbolic gas tax holiday plan alive for yet another day, announcing her intention to introduce gas tax holiday legislation. And last night in Indiana, the Senator explaining she wants to find out if Democratic members of Congress are "with us or against us" in battling big oil. HILLARY CLINTON: I believe it would be important to get every member of Congress on record. 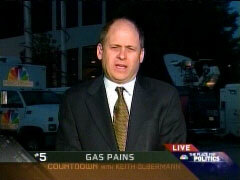 Do they stand with the hard-pressed Americans who are trying to pay their gas bills at the gas station? Or do they once again stand with the oil companies? That's a vote I'm going to try to get because I want to know where people stand, and I want them to tell us, are they with us or against us when it comes to taking on the oil companies? OLBERMANN: Senator Obama not alone in believing that that phrase, "with us or against us," had been borrowed from President Bush, as he claimed today. The Illinois Democrat again pointing out that Senator Clinton's gas tax plan already seems to have some friends on Capitol Hill. BARACK OBAMA: This was originally John McCain's idea. So John McCain proposed it, and Senator Clinton, right away, she said, "Me, too. I'll do it, too." Because I guess the polls said that it might be popular. The truth is, we've been doing this kind of stuff for years now. Every so often when gas prices go up, right before the summer, somebody in Washington proposes a gas tax holiday because it's an easy thing to do. OLBERMANN: Let's turn to our own Jonathan Alter, senior editor at Newsweek magazine, who's joining us tonight from Raleigh, North Carolina, in advance of the primary. Jon, good evening. OLBERMANN: Senator Clinton got the endorsement of the Indianapolis Star newspaper this morning, and even in that endorsement, the gas tax holiday plan was called political pandering. When asked to name an expert who supported this plan, the Clinton campaign could not. The answer was, "Well, this polls well with voters." So are they not only pandering but admitting to pandering and hoping that underestimating the intelligence of the electorate will work every time? ALTER: That's their bet, Keith. You know, they did that when they tried to link Obama to Ronald Reagan early in the campaign. They're essentially assuming that people are too stupid to realize that this is a bad idea that won't save them any money at the pump, that actually hurts us in fighting terrorism because we need to stop relying on oil from the Middle East. You know, it was oil money that funded those madrasas, that indoctrination of jihadists. So it's bad on so many levels. Hillary Clinton starts her rallies by saying, "We need jobs, jobs, jobs." Well, by the estimates of the Department of Transportation, this will cost 300,000 jobs, just this summer in the construction trade, not to mention making it harder for you to get to work, more likely to get into a car accident because it will bring repairs of our highways to a screeching halt. And then, just one other thing that is particularly strange about this. She talks about a windfall profits tax on the oil companies, which is a good idea -- Obama and others support this as well. The problem is: that won't pay for this gas tax holiday because she's already said that the money from a windfall profits tax will be used to develop renewable energy. So she's spending that $9 billion twice. And what she's hoping is that, you know, only elites will notice any of this and that everybody else just won't care. Her problem on this, Keith, is that there are a lot of elites who are superdelegates, and they're not buying this or at least some of the ones I've talked to here tonight in North Carolina were uncommitted. OLBERMANN: Well, to that point, the political strategy of this and whether or not it's the reverse of pandering, the same members of Congress that she's now calling out with this, you know, post-9/11 garbage about "you're either with us or against us," those are the same people that would constitute many of the undecided superdelegates. OLBERMANN: I mean, the Congressman, Mark Udall, who is undecided and a superdelegate from Colorado, who's now running for the Senate out there, fired back today about "you're either with us or against us." How does this add up? Is this another one of these "cut off your nose to spite your face" or not "see the nose for the face"? Or it has something to do with noses and faces, doesn't it? ALTER: I think it's a Hail Mary pass, and what they're figuring is, if they can run up a big victory in Indiana with this pander because a lot of people drive, you know, long distances in Indiana, and, if they can come closer than expected in North Carolina where, as I learned tonight, none of the politicians think she can actually win North Carolina, but she could come closer than expected. But then the superdelegates, you know, will figure, hey, maybe the best panderer is our best candidate in the fall. And that, you know, Obama is too, you know, hung up on the merits of these issues, the substance of these issues instead of the politics of the issues that we need to win in the old fashioned way and that that might actually, you know, be persuasive with those superdelegates even if they don't agree with her on the merits of the gas tax. I think that's what they're betting, and it's a big bet and they put a lot of chips on it. OLBERMANN: Well, how good a bet is it? Because, having said all this, having pointed out all the flaws, the techniques borrowed from Bush, the pandering, on the premise that a man dying of thirst rarely questions whether the water is clean or where it has come from, does she not have a winner here with this gas tax idea? ALTER: She might because there are a lot of what are called "low information" voters. You know, they're really not reading the unanimous, unanimous newspaper editorials against this. They're not talking to the environmentalists, the economists, everybody who unanimously believes this is a bad idea. They're, you know, understandably struggling, and at the pump, they're paying a lot for gas, and they want some relief. The trouble is, the thing that's so odious about this idea is that there are other kinds of relief. You could get a tax credit for people at the low end of the income scale. You could give them other forms of relief. This is the single worst kind of relief because it's terrible for global warming, terrible for foreign policy, and terrible for jobs. And so it's just unfortunate that she had to embrace what people agree is the worst single policy idea of the entire campaign. 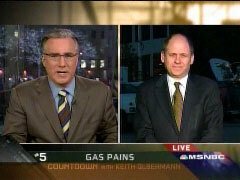 OLBERMANN: Jonathan Alter of Newsweek and MSNBC, in North Carolina tonight. Thank you, Jon. Have a good weekend.